With Comic-Con’s little sister convention, WonderCon, set to take place next week, it’s time for a WonderCon 2019 preview since for the first time, The Geekiary will be at the show. The event will take place March 29th-31st at the Anaheim Convention Center, about a 10 minute walk from Disneyland for those of you who want to hit up the Happiest Place on Earth after a day at a low-key (compared to SDCC) event. Having attended WonderCon every year since 2014, and Comic-Con for going on 25 years (I think), this convention is one of Dan‘s favorites of the year. 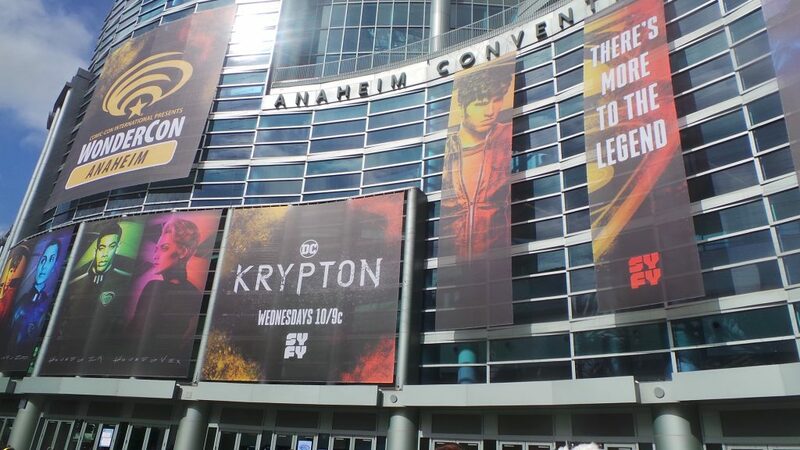 Unlike the big event that Comic-Con International runs every year in July, this one is still more comic book based, although in the past few years the Hollywood media has been slowly making their way to the show. If you’re not into the comic book aspect of the show, there will be a lot for you to do there as there will be panels for such shows as Into the Badlands, NOS4A2, Marvel’s Cloak and Dagger, Marvel’s Agents of S.H.I.E.L.D., The Tick, Cobra Kai Season 2, as well as Admin Angel’s favorite show Legion (which will have a screening as part of the panel, with most of the stars and executives present), and more. Movies will also be represented at the show with Dark Phoenix, Tolkien, and a Warner Bros. / New Line presentation that is to be announced. If you are into the comic book aspect, you can look forward to spotlight panels on such creators as Jim Lee, Tim Sale, Andy Kubert, Gerry Duggan, Donny Cates, Julie and Shawna Benson, Scott Snyder, Ryan Meinerding, Greg Capullo, and Jen Bartel. Of course there will be tributes at the show including the annual Jack Kirby tribute, as well as two panels for legends we lost in 2018. Stan Lee will be the focus of the first one, with John Rogers (President of Comic-Con International since the mid-80s getting his own tribute). In addition to the panels, CCI announced in their monthly Comic-Con Museum newsletter that at WonderCon the Petersen Automotive Museum in Los Angeles will have a sneak preview of their upcoming “Hollywood Dream Machines: Vehicles of Science Fiction and Fantasy” exhibition. In the past some of the non-comic book panels and events that take place over the weekend included Wynonna Earp (which had its world premiere during the sconvention a few years back), as well as panels for such other TV shows and movies including Agents of S.H.I.E.L.D., Edge of Tomorrow, Preacher, The Goldbergs, Lucifer, Midnight, Texas, and a lot more. This year the special guests include a wide variety of professionals that are mostly known for their work in the comic book industry, although some have branched out to other areas. The guest list includes Sergio Aragonés (who will also be the Guest of Honor for San Diego Comic Fest), Vita Ayala, Jen Bartel, Peter S. Beagle, Julie Benson, Shawna Benson, Kendare Blake, Greg Capullo, Donny Cates, Katie Cook, Damian Duffy, Cory Doctorow, Gerry Duggan, Mark Evanier, Michael C. Grumley, Joëlle Jones, Tom King, Andy Kubert, Phil LaMarr, Jim Lee, Tula Lotay, Ryan Meinerding (the Head of Visual Development at Marvel Studios), Greg Pak, Tim Sale, Liam Sharp, Dana Simpson, Scott Snyder, Brian Stelfreeze, Peter J. Tomasi, and Lee Weeks. As for the panels that Dan is most looking forward to it’s a wide variety but they include the Phil LaMarr spotlight, the above mentioned Dark Phoenix presentation, DC Celebrates 80 years of Batman, 30th Anniversary of Back to the Future Part II, Fanbase Press: 10th Anniversary Watchmen, Retrospective, The Tick, DC Meet the Publishers, Happy Birthday, Batman!, Cartoon Voices, as well as the tributes for both Stan Lee, and John Rogers…and who knows, maybe he will actually make it to the annual Masquerade this year! As this is Erin‘s first WonderCon, she is going into the convention with wide eyes. As a huge TV fan, she is looking forward to screenings of Amazon’s Hanna, BBC America’s A Discovery of Witches, and The 100 season six premiere. With the convention being a bit smaller and more intimate, she is also looking forward to more fan-focused programming, especially with panels dedicated to Psychology of Harry Potter and Crimes of Grindelwald, Gay Geeks and Where to Find Them, and GeekFest’s Women of Sci-Fi. Needless to say, there is a lot going on within just three days of a pop culture convention. Be sure to watch The Geekiary’s social media channels to stay up-to-speed on all things WonderCon!